Prepare yourself guys...you're going to be getting a lot of plaid from me this season thanks to the new Zara store that just opened (FINALLY) at Scottsdale's Fashion Square Mall. Good news is that Zara's current collection is chock-full of this season's must haves: rubber-soled platforms, whimsical dresses and leather and plaid/check everything. Sad news, I'll probably be broke by New Years (damn you inexpensive-yet-high-fashion retailers!). As for this week's trend of the week, I opted for a simple H&M button up dress I picked up the other day. 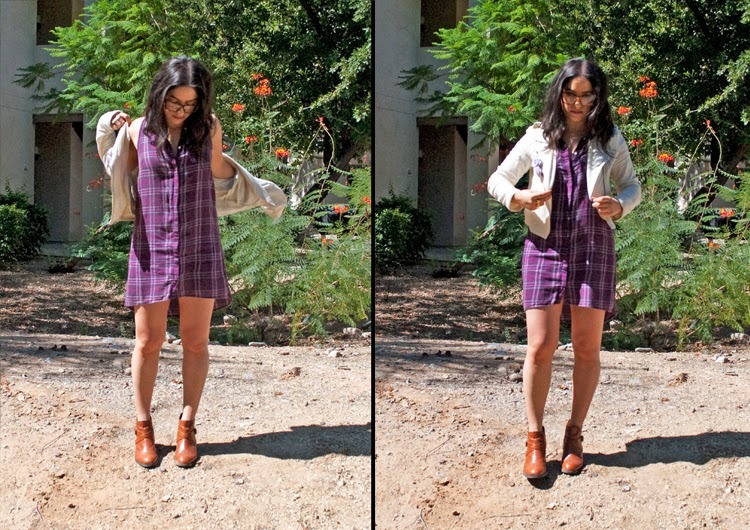 It can easily be belted or left loose, but I paired this dress with my new linen Moto jacket I picked up in Santa Monica this past summer. The weather hasn't gotten completely leather-ready yet, but I had to bust out my favorite Chelsea boots I got in London a while back. Whatever, it's fall...at least I don't wear Uggs in July (or ever, for that matter).